Minimum $10.00 for delivery. delivery within 3.5 Miles. Broccoli,green pepper,corn,mushroom,black mushroom carrots w.garlic sauce. Crispy boneless duck meat,served on mixed vegs,w.New York stlyle . Hot !Shredded beef ,dry sauteed until crispy mixed with shredded carrots and celery served in tangy spicy sauce. Marinated chunks of chicken fried and sauteed with orange avored tangy wine sauce served with broccoli. Chicken in batter with broccoli and sesame seeds in a wine sauce. Deep fried chunk of chicken in hot pepper,tangy wine sauce.served in broccoli . Sliced beef & frech sea scallops with broccoli,fresh mushroom and water chestnuts in a special sauce. Hot! Jumbo shrimp sauteed with onion ,green pepper,carrot,mushroom in hot chili sauce. Special marinated jumbo shrimp sauteed with broccoli,in egg white sauce. Lobster,shrimp,chicken ,beef,roast pork,crabstick with mixed vegetables in brown sauce. Shrimp ,beef and chicken sauteed with Chinese vegetables in Chef's special sauce. Beef ,roast pork,shrimp ,chicken w.mixed vegetables in Chef's sauce. 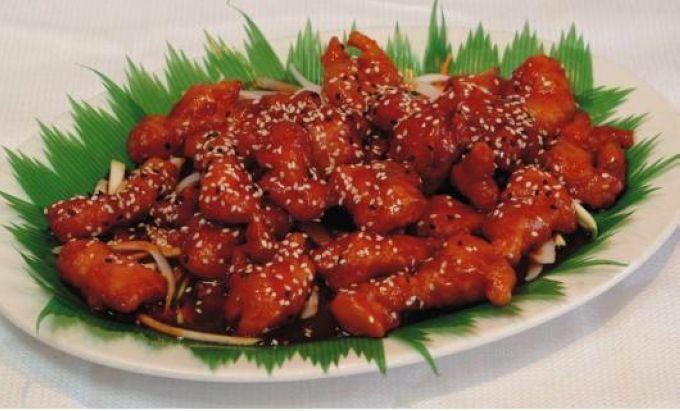 Hot!Crispy outside and tender inside chunks of beef with orange or sesame favor sauce,broccoli on the side. Deep fried shrimp in hot pepper tengy wine served in broccoli. Broccoli,Chinese vegetables,corn,mushroom carrots,lobster,scallop ,shrimp ,crabstick. Jumbo shrimp,sea scallops,lobster meat and crabstick sauteed with mixed veg.in taste seafood sauce. Jumbo shrimp & fresh scallop w.snow pea,green pepper,broccoli and water chestnuts in garlic sauce. Fresh jumbo shrimp split open each enfolded w.bacon egg pan fried w.onion & pepper in a tomato sauce w.peanuts & scallion . Sliced beef w.onion ,scallion ,w.Special sauce. Sliced Chicken w.onion ,scallion ,w.Special sauce. Chinese eggplant ,sliced chicken & prawn sauteed w.garlic sauce. 2 Spring Roll ,2 Chicken Wings ,2 Taiyaki Beef ,2 Cheese Wonton ,2 Fantail Shrimp ,2 Bar-B-Q Spare Ribs & Shrimp Toast .